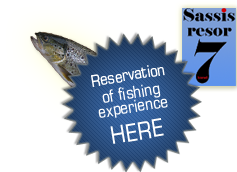 for Marketplace 7-Härad and Sassis Resor 7-Härad is that angling tourism, in all its forms, should be developed on nature’s terms. Eco-tourism gives local businesses a lift and at the same time ensures that the area’s natural assets are protected. Nature’s Best is a pioneering quality mark for responsible outdoor tourism in Sweden. It is the first national quality standard for eco-tourism in the northern hemisphere and was launched during the UN International Year of Eco-tourism in 2002. Although Marketplace 7-härad and Sassis Resor 7-Härad is not yet certified by “Nature’s Best” we are already working according to its framework and aim to be certified in the near future. ces, and it is important to have sufficient knowledge in this matter, to prevent or minimise the possible negative effects of angling tourism. Here we focus on an important nature conservation problem in fresh water – the spread of foreign or undesirable species. In order to insure that tourism is developed in harmony with the laws of nature, criteria are required for among other things sustainable fishing tourism. Within Marknadsplats 7-Härad and Sassis Resor 7-Härad work of this character is continually carried out. mental Sciences, criteria adjusted to local conditions have been developed. The purpose of this work has been to investigate and compare different forms for the administration of fish stocks affected by fishing tourism, and on the basis of this draw up a fishing policy proposal for Sassis Resor 7-Härad and Marknadsplats 7-Härad. A particular emphasis is placed on the advantages and disadvantages of the administrative form called catch & release. The work was carried out in collaboration with students on the Water Management Course at the Department of Zoology, University of Gothenburg.